Hello… this is Brandi Koch. I have resisted the urge to read over comments on this site for too long… my curiosity finally got the best of me. I noticed that someone calling themselves “Robert” threw a challenge out there for anyone to “go stay with the Koch’s for a couple of weeks”… you claimed to be un-phased by the idea/challenge, claiming that you would be more than happy to do so & wondered if he could “arrange a visit”. Well, he can’t… but, I can. I would be more than happy to welcome you into my home for a week or two… if you think that this is a joke–think again. Yet, three month’s earlier, she had personally signed the 990 tax form for the year 2005, which listed donations of $17,165 and expenses of $2,819 and $1,715 on a new computer listed as an asset. Why then did Leitao attempt to characterize the money involved as “tiny chunks”, when clearly thousands of dollars are involved? Apparently $10,000 was donated by one person, who was then not able to get any information as to where the money went. “Morgellons” is the name Mary Leitao chose for what she considered to be a mysterious new illness afflicting her son. Doctors told her it was just eczema, and that the fibers she found on his lip were just lint. But she was determined it must be a novel new disease that she personally had discovered, so she set up a foundation to publicise it. Eventually, via the internet, other people join her organization, the list of symptoms constituting “Morgellons” is expanded to include these new people. Eventually the list of symptoms becomes very broad, and encompasses just about any medical condition. 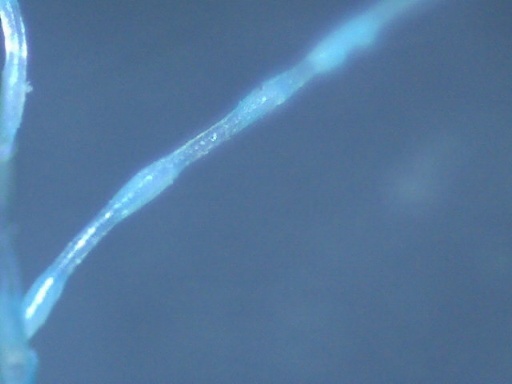 Doctors reject “Morgellons”, since the symptoms are explained by other diseases, and are too varied and vague to constitute a working definition of a new disease. But the “Foundation” continues on its mission of “raising awareness” of “this disease”. With lots of hard work they get some press coverage, then some local TV coverage, and then eventually some major TV coverage. Each time the story is the same. Some patients are presented who are obviously ill. Their doctors have told them Morgellons is not a real disease, and the fibers are just lint or hair. Wymore says it is a real disease. The CDC is investigating. The end. As you can see here, Morgellons was a short-lived phenomenon. The local media coverage spurred interest which faded away. The CNN story spurred some interested, but was limited by the audience. Finally two huge spikes surround the networks morning shows and the “Primetime” special, then nothing, it tails off to zero after the next two months. So what’s going on? Was Morgellons just a product of a media desperate for news during the silly season? The MRF supplied them with an interesting sounding story, and they ran with it? Then what happened? Where did Morgellons go? People are still sick, that’s for sure. People are still going to the doctors with excoriations, and with itching, and with fatigue, and with baggies of fibers. That’s not going to stop. There are a variety of reasons for that, and those reasons are not going away. But “Morgellons” has gone away. It was a label someone decided to put on a bunch of symptoms without any evidence to indicate that anything unusual was happening, and contrary to the opinions of the entire medical community. A few people publicised it very well for a period of time. The media ran the story, but now they’ve “done that”, and there will be no more stories. Save the inevitable CDC report on “insufficient evidence”, the inexplicable advocacy of Professor Wymore, and the interminable and sad believer’s theories on Morgellons discussion boards, Morgellons is over. Morgellons is over, but people are still sick. They are probably more sick now than when the MRF started their media campaign. By popularizing “Morgellons” as an actual disease, it gave validity to those who disagree with their doctors, self diagnosed, and chose inappropriate treatments. Morgellons is over, but the damage is done. It’s been a challenging summer for the usually dominant ABC. How tough? Reality offerings have crashed and burned. Few are watching reruns of “Lost,” “Grey’s Anatomy” and “Desperate Housewives.” But things are looking up. ABC News’ “Medical Mysteries” series, which examines bizarre medical conditions, has turned out to be a real crowd- pleaser. So it’s not surprising that they would continue to promote the series, and as part of this promotion offer up a preview story on their ABC “news” site, right next to the wolfman, the echolocating blind men, and the women who smell like dead fish. The ABC Story features Morgellons Patients: Brandi Koch, Anne Dill, Greg Smith and also Mary Leitao, the founder of the MRF, and her son, Drew. Armed with research, Leitao took her son to a doctor at one of the country’s leading hospitals. He dismissed her tale of fibers and wrote to her pediatrician, saying that her son needed Vaseline for his lips and that his mother needed a thorough psychiatric evaluation. A disease where infants have a fever, and then you rub milk on them, hairs spring from their backs, which you pluck, and the fever vanishes. Nothing to do with anything. Why do they keep bringing this up? “What I saw were bundles of fibers, balls of fibers,” Leitao says. “There was red and blue.” Even stranger, they glowed under ultraviolet light. I have explained red and blue fibers before. I’ve also explained the glowing (although that’s usually white fibers, which Mary also found, just did not mention in this story). I’ve even discussed the fibers emerging from his lip. There is no evidence at all that Drew had anything at all unusual going on. Dr. Greg Smith of Gainesville, Ga., has been a pediatrician for the past 28 years. He claims a fiber is coming out of his big toe, and he has video footage to prove it. Video footage of fibers emerging is something I’ve been suggesting for a while. The fibers are the only really interesting thing about “this disease” for which you might have a chance of getting some evidence. The fibers, about the size of small eyebrow hairs, are not living organisms, Dr. Wymore decides. He teams with a Tulsa police department crime lab to sort through fiber samples, and though the lab owns a database of more than 800 fibers, these fibers match nothing. I’ve got more. 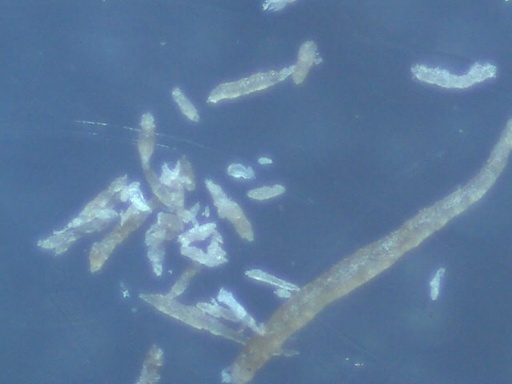 My point is that 800 fibers might cover 90% of the common household fibers found in your average bit of lint, but there’s still probably over 10,000 other uncommon fibers like the above – lots of room for unidentified fibers. 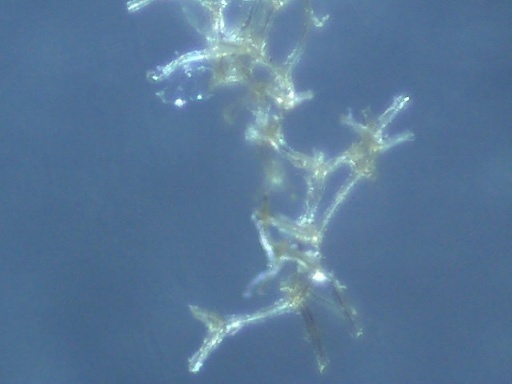 (A prize to the first person to correctly identify the above two photos – they are from a QX5 at 60x, so are about 3mm across). I KNOW they don’t have that one in their fiber database. Why? I made it myself, simply by firmly rubbing my upper arm with a fingertip after having a hot shower. Some old sun-dried skin sloughed off, and rolled up with natural skin oil and sebum, forming this fiber-like shape. Everyone has these “fibers” from time to time, not everyone really looks at them with a microscope, or asks the police to identify them. He recruited two Oklahoma State faculty physicians. They tweezed fibers from beneath the skin of some Morgellons patients who visited the Oklahoma State Center for Health Sciences in Tulsa in February, Wymore said, and sent those samples to the Tulsa Police Department’s forensic laboratory. The police checked the samples against carpet and clothing fibers and other materials, and conducted chemical analyses and other tests. Nothing matched, said Mark Boese, the police lab’s director. “How it is being produced, I don’t know,” Boese said. He theorized the fibers could be produced by human hair follicles that somehow encapsulated pollutants processed by the body. I’ve nothing against the Tulsa Police forensic department (although they do seem to be big fans of CSI). But again, all they have said is they cannot identify some fibers, and they don’t think they are man-made or plant fibers. Hopefully more information will be forthcoming, but they have not explained how they have scientifically determined they are “some strange stuff”. What tests were run? What were the results of the tests? The Tulsa police has some nice equipment. Were these tests run with public money? Can we have the results? Maybe we’ll see more more details on the show. But remember, ABC is here to entertain you, their aim is to build market share. Keep that in mind, when weighing their evidence. Is it possible that there is some less entertaining evidence? How many fibers were looked at? How many of those fibers were simply not entertaining enough? The changes at the Morgellons Research Foundation continue, after removing all references to nurses, and expruging Dr. Randy Wymore, Dr. Greg Smith, Charlse Holman and Cindy Casey, William Harvey is the new Chairman of the board. The text “For our first Corporate Donation. Thanks to all the folks at SeaChange for their support..” has vanished from the “sponsors” page. One wonders if this has anything to do with the recent allegations of financial problems. The photo with the large check is also gone from that page (although it’s still on the site). I was wondering if they were going airbrush people out of that photo, given the swiftness of the removal of their names from the site . But I guess there were too many people to remove. I think it’s too early to comment on the meaning of all this, so I’ll wait and see how things pan out. Of note is the big ABC Primetime: Medical Mysteries on Wednesday night at 10PM. This is the great hope of the MRF, something they have been working on for months. It’s airing will be a turning point, one way or another.